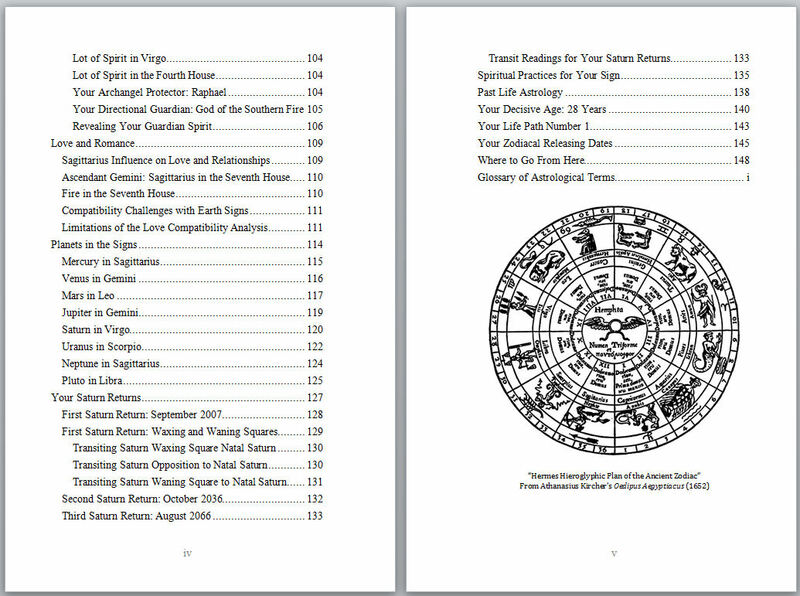 Back by popular demand (in case you’re like, what does that mean, I stopped offering this service for a while due to it basically taking over my life), the birth chart monograph is a minimum 90,000 word book about your personal astrology. There is also the secondary purpose of teaching you astrology. 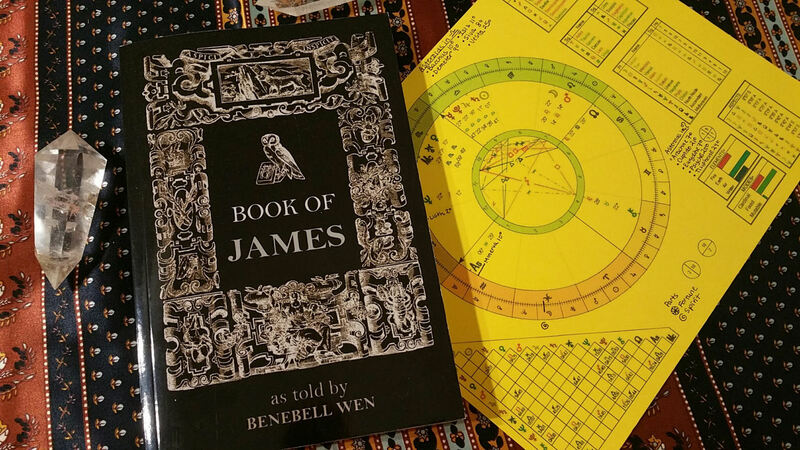 Then there is even a third mission of this monograph being a form of divination, or bibliomancy for you to reach for time and time again throughout your life path. 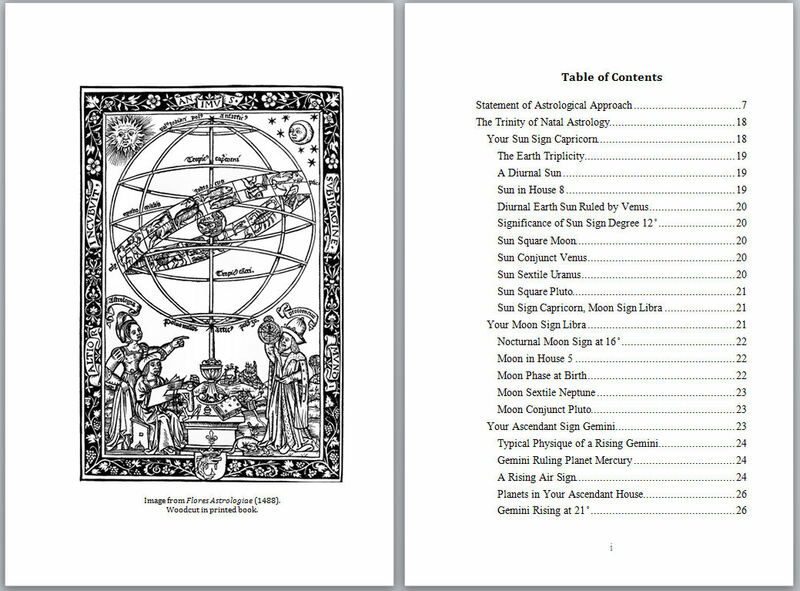 You will receive both the PDF and DOCX files of the monograph, formatted to 6″ x 9″ standard trim size for trade paperback with gutter and page margins all set up and ready for professional printing and binding into a hardcover or paperback book, which you would do on your own time through a third party print-on-demand publisher. I only provide the digital soft copy of your book. 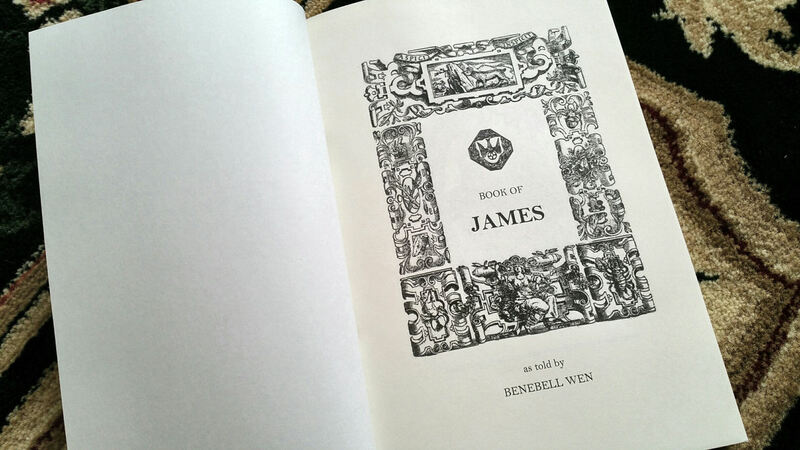 I also include a stock book cover design with the book title Book of ____, with the blank line filled in by your name. 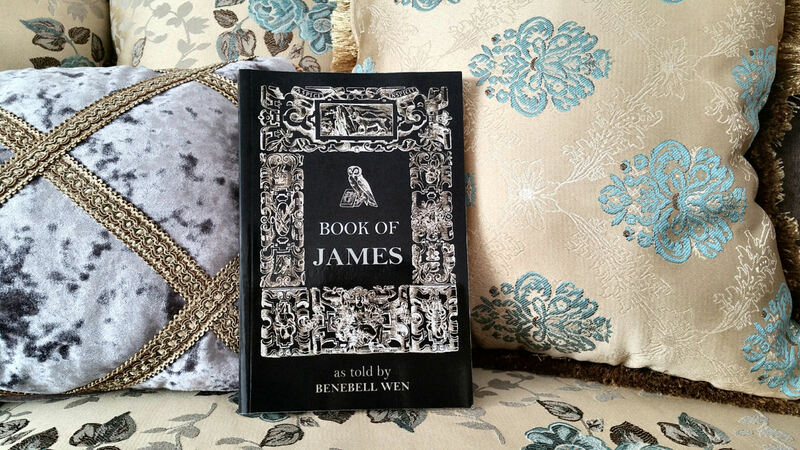 Above and below are examples of what the cover looks like if your name was James. 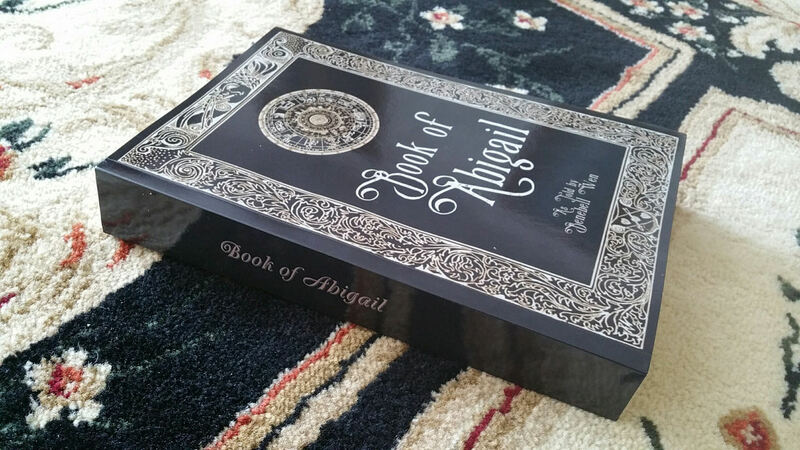 Earlier you saw the Book of Abigail. I’ve also set the intention for every monograph I prepare to be used as a form of bibliomancy. Some suggestions for how to use the monograph for divination are provided, though of course you’re not limited to those suggestions. Inserted throughout the book, in between sections (practical reason: when there’s too much blank space left over at the end of a chapter or when I want a new chapter to begin on the recto, i.e., on an odd page, and doing so means a blank page), I’ll fill that blank page with an oracular message from the I Ching or lovely public domain classical art. I specially select art from old grimoires, medieval alchemical texts, that call to mind mythology relevant to some of what I cover in your monograph, and other art forms I find to be more spiritual or religious in perspective (covering all the major world religions). 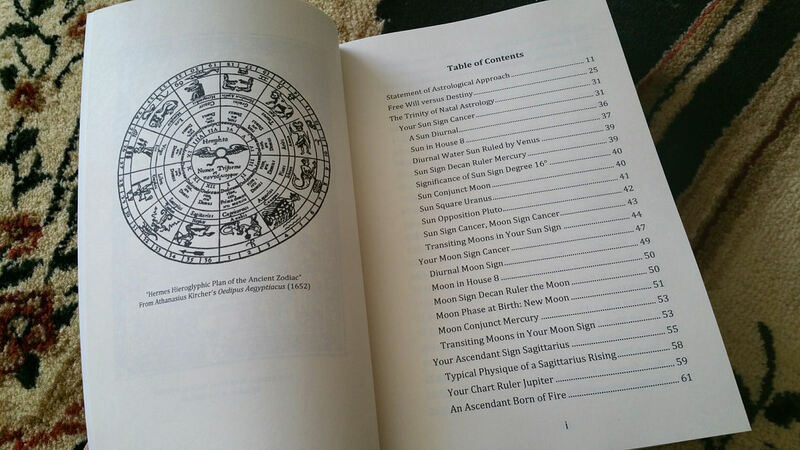 Your book comes with a table of contents and a glossary of all astrological terms used throughout your monograph, so when in doubt and I’m using astrology jargon and you don’t know what that term references, you can quickly flip to the back of your book and look up that term in the glossary. However, unfortunately, there is no index. I understand this book would probably be doubly indispensable with an index. That said, I do provide you with the DOCX file, so if you’re savvy with MS Word, I welcome and encourage you to fix up your own monograph before sending it off to the printers for book production. 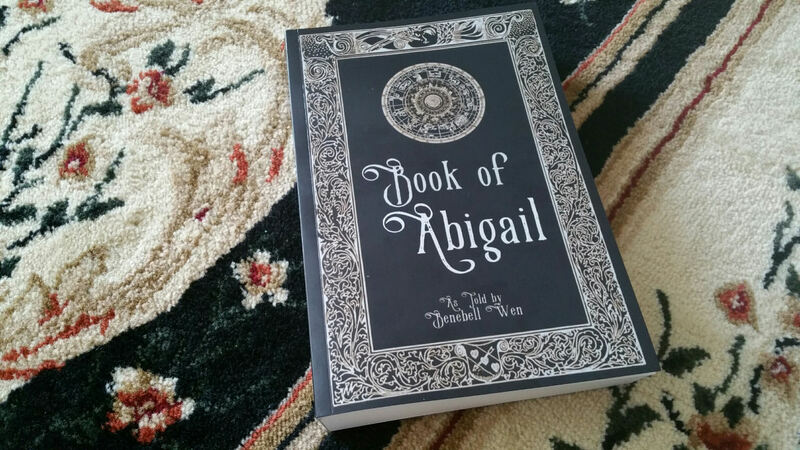 Above, after printing out the book in paperback form on your own, you get a sense of the thickness for the book. 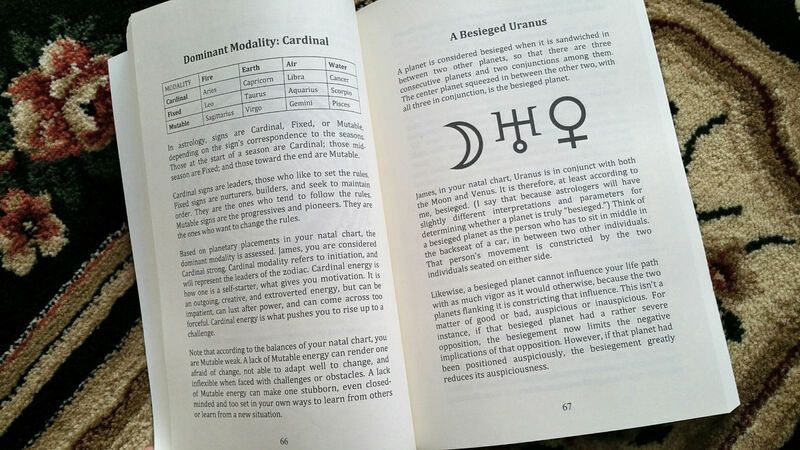 Now the thickness of your birth chart monograph compared to, say, Holistic Tarot. We will cover your sun sign, moon sign, and rising sign. It will cover elemental triplicities, distinctions between diurnal and nocturnal sect placement, house and sign analysis, decan rulership, significance of degrees for your sun, moon, and rising, significant angular aspects, and significance of moon phase at time of birth. Since I read with the whole sign houses system, we’ll cover generalities about the signs in your twelve astrological houses per your ascendant. We will address what each of the zodiac signs mean as they fall in the twelve astrological houses of your birth chart. You have Pisces in the third…what does that mean exactly about your intellect, reasoning ability, way of thinking and communicating? Say that your ninth house is occupied by the sign Libra. What are the implications there? 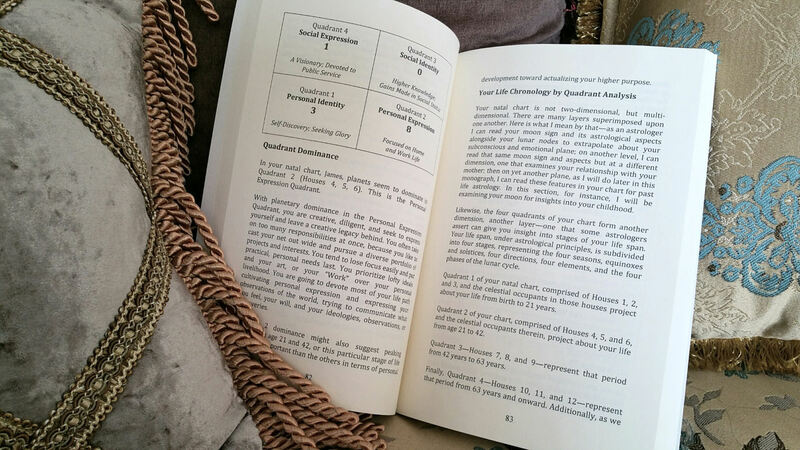 This section will go through the twelve houses and how the signs in those twelve houses of your chart mean about your life path, your fate, fortunes, and personality. Are you Fire, Water, Air, or Earth dominant and what would be the implications of such elemental dominance? Are you Fire, Water, Air, or Earth weak and what are those implications? How do you support your elemental weaknesses to create greater balance and harmony in your life? Based on elemental analysis, who are your spirit attendants from the animal kingdom (also referred to as animal totems)? We’ll talk about your Decisive Age. I’ll also provide a progressed chart (and tell you what a progressed chart is) for the year of your Decisive Age. There’s some free resources on what a Decisive Age is here on my site. Your reading will also cover your midheaven sign and, since I read under the whole sign houses system, whether there are any discrepancies between your midheaven and tenth house. We’ll cover the major angular aspects to your midheaven and the implications of those aspects. Are you north or south hemisphere dominant and what does that mean about you? East or west dominant and that implication? Which quadrant of your chart is going to dominate in your life? Also, this feature will give you a life chronology of how to navigate the four quadrants of your life– (a) birth to age 21, (b) age 21 to 42, (c) age 42 to 63, and (d) age 63 and onward. I have a lot to say about stelliums and grand trines. If there is a stellium or a grand trine in your birth chart and you would like to know more about the implications of your specific stellium or grand trine, then this option will appeal to you. However, if there is no stellium or grand trine in your chart, then this option makes no sense. I will also cover the overall chart shape and its implications in this option, your leading planet, along with assessment of any peregrine or besieged planets I observe, any other unique angular patterns (such as the Yod, or Hand of God), any elevated planets, Herculean Ternaries, Mark of an Empath, etc. In addition to your ascendant and midheaven, let’s talk about your co ascendant, polar ascendant, north lunar node, and south lunar node. Please note that this is its own standalone reading option, the Inner Darkness Inner Light reading. This chapter will examine facets of your shadow self and also reveal your inner light. This is not astrology per se, though some facets of this option include astrology. What is your Decisive Age? What is your Life Path number? We’ll cover both in independent sections of your monograph. Your monograph will go in-depth about your Lot of Fortune to reveal how you can best utilize your assets and attributes to manifest financially prosperous opportunities for yourself. Your Lot of Spirit will reveal your spirit guides since birth, the archangel per Judeo-Christian mythos that corresponds with your Lot of Spirit, and your directional guardian per Chinese Taoist mythos. Please note that this is its own standalone reading service, Your Prosperity Advisor. This chapter will examine your professional potential and also offer insights into how you can utilize personalized feng shui guidance to optimize your prosperity metrics. Let’s focus on the seventh house of your chart, the eighth house, your Venus sign, Juno, and your fifth house. Let’s talk love, romance, romantic compatibility, your Juno return dates, and the pursuit of happiness. One chapter in your monograph provides all of your Jupiter Return dates for a 100 year period from the date of your birth. Jupiter Returns mark the most auspicious periods in your life, at least per established astrological principles. Another chapter will include the dates for your First Saturn Return, Second Saturn Return, and Third Saturn Return, and all the waxing, waning, and opposition transits in between. 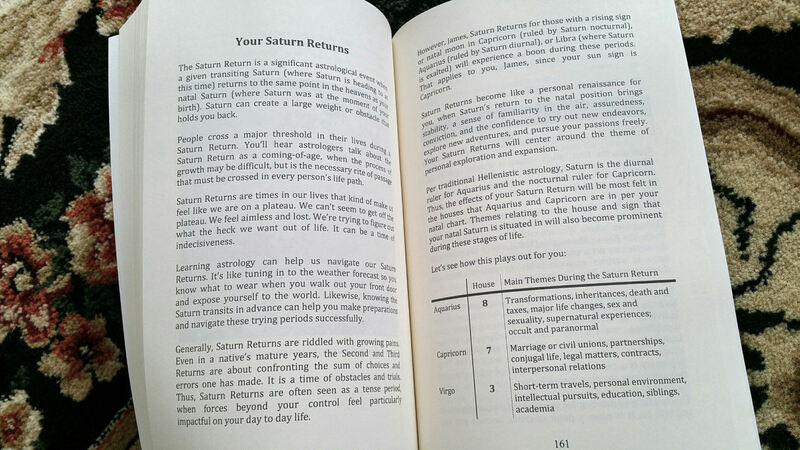 This chapter also offers insights and recommendations on how to navigate your Saturn Returns. Saturn Returns mark the crossing of major thresholds in your life path. 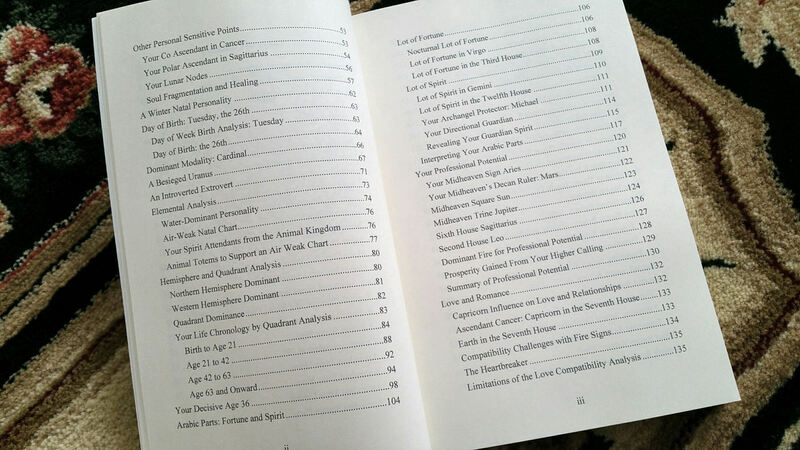 This chapter covers past life astrology and how analysis of past life astrology relates to present life astrology for your moon sign, fourth house, eighth house, and twelfth house. 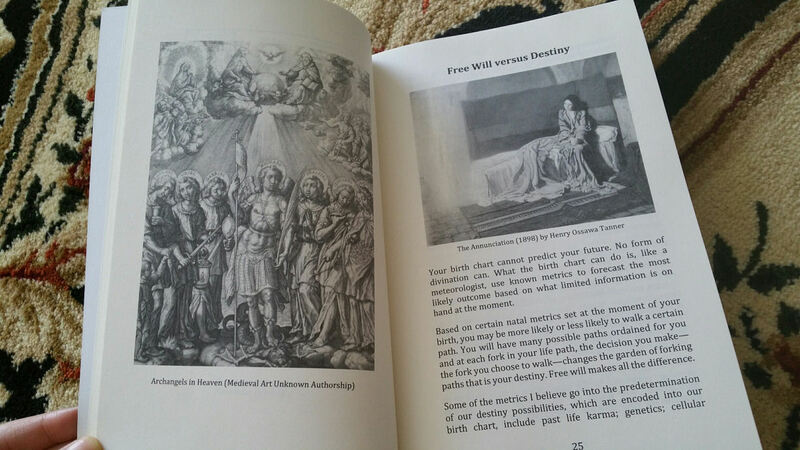 Note that this chapter is the same as Part I of the Past Life Reading service, a standalone reading option I offer. There are about 45 asteroids I study and it does not make economical, practical, or even divinatory sense for us to cover all 45 asteroids in your chart. Instead, I’m going to look at key asteroid influences, but what “key” means will differ from individual to individual, case by case. 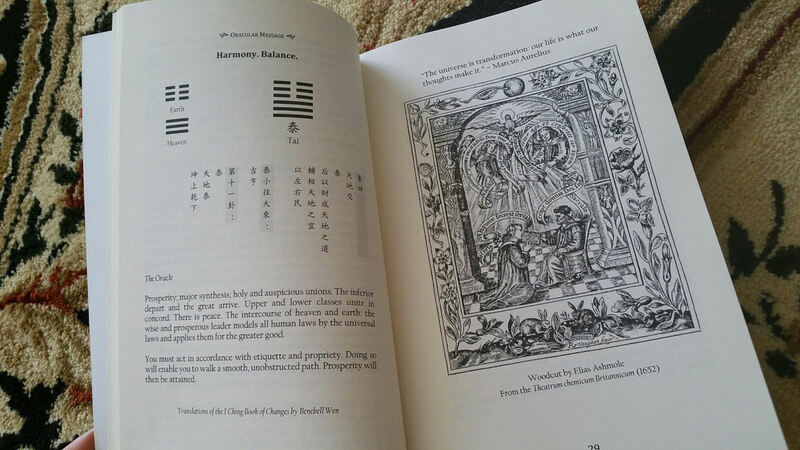 One chapter will cover your seven rays, per esoteric astrology. Another chapter will address your social responsibility per eleventh house analysis, and yet another will cover the spiritual practices keyed specifically to your sun, moon, ninth house, and Neptune. 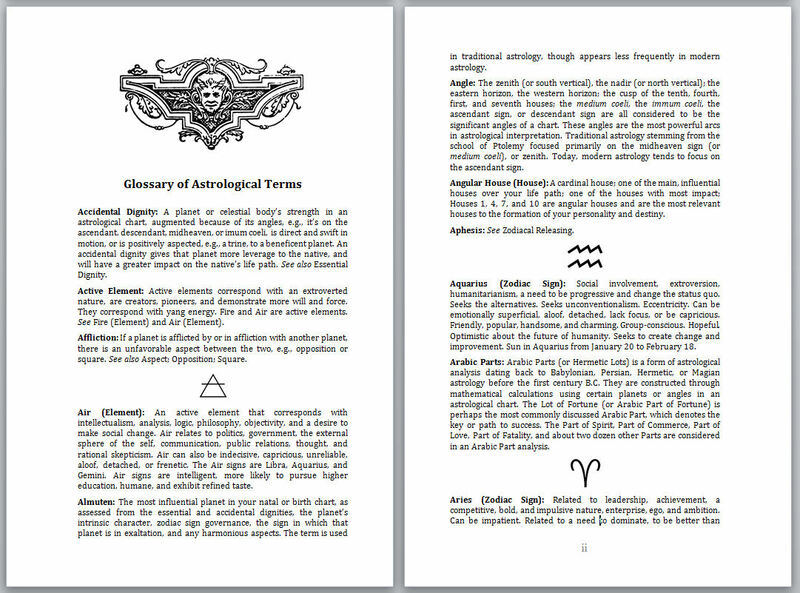 At the back of your monograph will be a copy of the Glossary of Astrological Terms. It’s a free download here on my website, by the way (scroll down). The main reason for tucking this in to the back of your book is for your convenience of reference. That way in the content of your monograph, I can simply say something like “profection,” “quincunx,” or “almuten” and trust that if you want to know what that word means in the context of your reading, you can flip quickly to the back of your book, look it up in the glossary, go “oh, okay,” and then return to the paragraph you were reading. 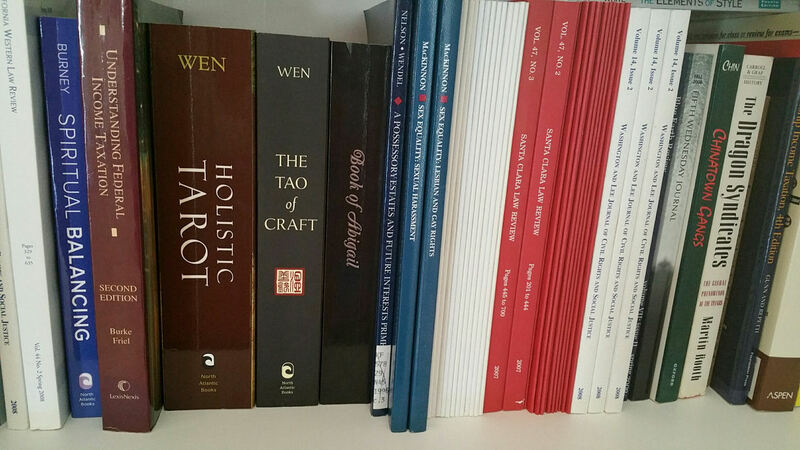 Your natal chart monograph is approximately the thickness of my second book, The Tao of Craft. At this time when you order your monograph, you’re also saying you’re ready to wait the full year for delivery. In other words, for all orders placed right now, delivery will be some time before the end of 2018. By placing your order, you understand that delivery term and thus, there is no set delivery date. My momma, who is over 65, said it is not going to be easy for her fellow elderly folk to figure out how to upload my PDF, walk through all those prompts, instructions, and steps, and produce a good paperback or even hard cover copy of the monograph. And she said it was unfair and shameful of me to assume. She raised her daughter better than that. Alrightey then. So. If you’re 65 years or older and you order a monograph, I will help you create the paperback or hard cover version of the book for free and arrange for it to be shipped to you. All you have to pay is the actual cost of the book that Lulu.com charges and the actual cost of shipping. Cost of the book is around $20 or under. Cost of shipping will depend on where you live. This production service is only free for our elderly friends. …Otherwise, You’re On Your Own. For everyone else, please understand that while I have done what I can to ensure that your files will upload and print through popular third party print-on-demand publishers, I can’t guarantee it. That is an issue between you and the third party print-on-demand publisher. If you experience technical issues with your upload and printing order, then you need to contact your printer, not me. 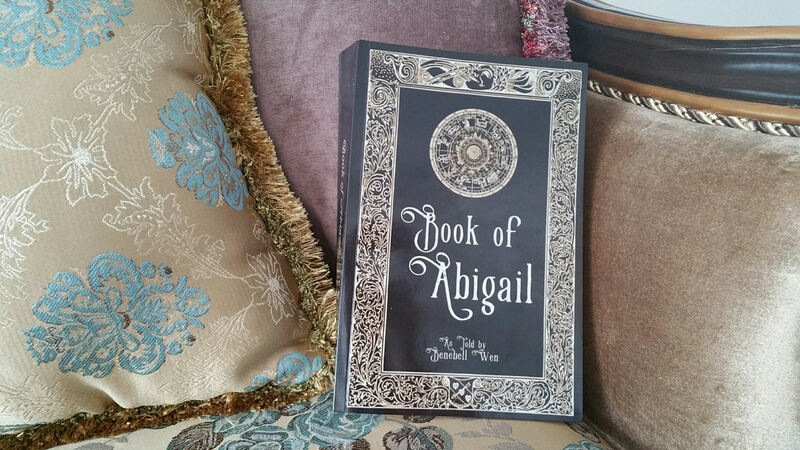 I am not responsible for actually getting your book printed in hard copy. I am only responsible for delivering to you a PDF and, at your additional request, a DOCX file of your monograph. You’re not paying for a hard copy printed book. You’re paying for my astrology services. Oh please I pray to all things holy that you don’t seriously believe I’ve written from scratch 90,000+ words or over 300 pages of text just for you for the mere fee of $175.00……. Yeah, no. By and large the text in your monograph is pre-written from a proprietary master book I’ve prepared myself for these monographs. In other words, let’s say you are a sun sign Taurus. I’ll go into my master book, find the section I’ve pre-written about sun sign Taurus, then copy and paste it into your monograph manuscript. If your sun Taurus is under the decan ruler the moon, I have a pre-written paragraph just on sun Taurus under the decan rulership of the moon, and so I then insert that in to your manuscript. Say your rising sign is placed at 13 degrees. I have a pre-written passage on the interpretation of a rising sign at 13 degrees and will include that into your book. And so on and so on it goes. However, I’m not generating the book through any software programs. It is all done manually, section by section, by me, with your birth chart printed out as a visual for me to constantly refer back to as I assemble your monograph by hand, one chapter and one section at a time. Thus, because there is that personal touch, when I see discrepancies, unique patterns, something anomalous, I can then add in customized text just for you to help you make sense of the pre-written text. 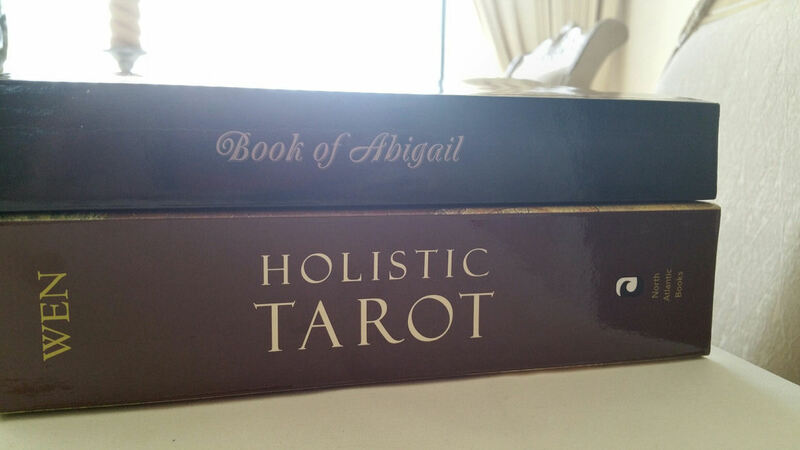 For a full service listing of divinatory reading options I offer, click on the banner. what is it and where did you get it. lol, that isn’t shallow! I always ask questions like that! Unfortunately, I have no idea. It was a gift. It came as a set, with a pair of earrings. You are so cool! I’m excited to see you’re doing this, and I think it’ll be really productive. (I’m also glad to see you’re actually charging for your services.) Good luck, and try not to get too swamped! Thank you! And I think I just did.. get swamped in my inbox, that is. Fun times! ❤ I do love this, though. It's so incredible. For me, it's like reading memoirs. And then, like, writing a book report about the memoir that I have to present to Teacher. Please put me on the list, pretty puhleeze! I wanted to book a reading with you a little while ago but you weren’t accepting requests because you had just started the new book; I figured that would be it for a year or 2 before you were taking requests again. Considering that I was VERY wrong about that timeline, sign me up! Oh my god Benebell, how on earth do you manage this hudge workload. I’m to late apparently, I’ll wait till things are cleared up a little for you and will book surely a reading. Thanks for who you are and all you do! How do I get in contact with you to order one of these? Do you have any sense of when you might be offering this service again? Thanks! This book changed my life in so many ways. Whenever you open us this service again I plan to immediately purchase one for my daughter. I owe you. Seriously. Sending love.